If you’re in the market for a city-friendly car that’s bigger inside than you’d think, then look no further: the 2016 Honda Jazz and the 2016 Suzuki Baleno are here to help. As we’ve come to find out, both of these city cars – the Honda built in Thailand and the Suzuki built in India – have above-average interior space, meaning both will likely appeal to buyers who want a light car that isn’t light on practicality. There are some differences between what powers these two, and the prices that each of the respective brands is asking for them. Let’s see how each stacks up. Let’s start with the price difference between the two cars we have here. 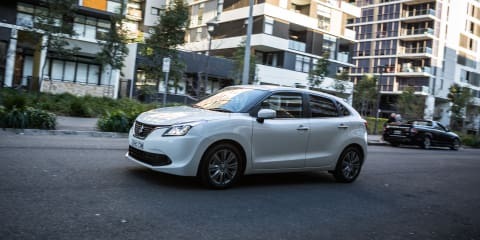 The Suzuki Baleno GLX Turbo is the more expensive of the two, priced at $21,990 plus on-road costs. There is a more affordable Baleno available, with a few less features and a less powerful engine (more on the powertrain later). The Honda VTi-S model isn’t quite as expensive at $19,790 plus on-road costs, but you could get the dearer VTi-L model, which has a few extras (including leather, which neither of these two has: it’s priced at $22,490). To justify that extra (non-promotional price!) buy-in cost over the specs we have here, the Baleno has an alarm system, and it also has push-button start. The Baleno also betters the Jazz in terms of infotainment, with Apple CarPlay connectivity, and it has satellite navigation, which the Jazz misses out on. Both have front fog lights, and the Jazz has LED headlights but they’re automated, and they won’t turn off if you forget. The Baleno has HID headlights that go on and off automatically, and it has LED daytime running lights. Both have six-speaker stereo systems, with the essential Bluetooth phone and audio streaming, and both have USB inputs and auxiliary ports (the Baleno with just the one USB and one auxiliary, while the Jazz has two USB inputs, an aux jack and a HDMI input to play movies). Both have climate control, but neither has rear-seat air vents. The Baleno, however, has tinted rear windows that should help keep its cabin cooler in the warmer months. As for safety, both cars have rear-view cameras displaying on their media screens, and both cars have six airbags, with dual front, front side and full-length curtain coverage. Both have 16-inch alloy wheels with 185/55 rubber (the Baleno with Bridgestone Ecopia and the Jazz with slightly sportier Bridgestone Turanza tyres). 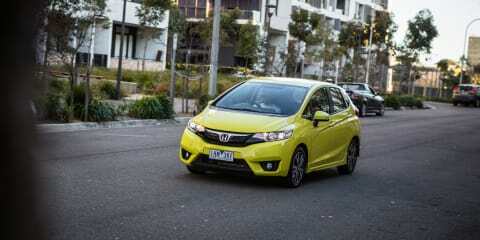 And if you like the colour of the Jazz we have here – or if you’re a fan of colours in general – you’ll more likely err towards the Honda, as it has eight colours on offer (black, two blues, grey, red, silver, white and this hue, Attract Yellow). Everything but red attracts a $490 fee. The Suzuki has four colours only: white (the only non-metallic paint), blue, grey and silver. The premium for the, er, premium colours is $500. As we mentioned previously, these two are here for their clever packaging, and in terms of size, there’s almost nothing in it. The Jazz measures just one millimetre longer than the Baleno (3996mm v 3995mm), but the Honda is notably taller (1524mm v 1470mm) and narrower (1694mm v 1745mm). And if we’re talking boot space, there’s a litre difference between the two: the Jazz claims 354L of cargo, where the Baleno boasts best in class boot capacity of 355L. Better leave that last carton of milk at the shops, Jazz buyers! Both have space-saver spare wheels under their boot floors, too. For context, these two have interior space and practicality that betters cars in the class above. For example, the Mazda 3 hatch has just 308L of cargo space, where a Corolla hatch has 360L. The exceptional space isn’t just in the boot, though, with both of these two pint-sized hatches offering interior space that again betters cars in the class above – not just those in the passenger car class, but also in the small – and even medium – SUV segment. The cleverness of the Jazz isn’t just its tall body, but also its large door apertures, and its “Magic Seats” in the rear. Those 60:40 split seats fold completely flat to form a nice even floor area, allowing the Jazz to essentially double as a moving van if required. If the items you have are too tall for that, the rear seat bases can also be flipped up to allow you to store items straight onto the floor of the vehicle. It’s brilliant. The Baleno isn’t as smart: indeed, its boot opening is quite high and quite narrow compared with the Jazz, which has a lower lip and a broader opening, which makes loading in heavy or large items easy. However, the Suzuki does have a shopping bag hook, which the Honda misses out on. The Baleno’s rear seats don’t fold flat when you lower them, nor do they have the abracadabra function of its rival. As for human space, the two are a little closer. The Jazz’s second row offers more than enough legroom for a six-foot-tall occupant to sit behind another, although those in the back may find the seating position to be a little bit ‘knees-up’. Still, there is ample toe room and enough headroom to suffice, too. The Baleno, likewise, offers deceptive levels of interior space, with excellent legroom, good toe room but a little less headroom than the Jazz. Its rear seating is a little more relaxed, with a marginally longer seat squab making it potentially a little more comfortable for longer trips. If you’re not planning to shift big humans often, the child-seat anchor points could be of more use. There are dual ISOFIX rear attachments in the back seat of the Baleno, and it has three top-tether points, too. Disappointingly, the Jazz has no ISOFIX attachment points, and only two (outboard) top-tether points. Neither car has rear-seat air-vents, but storage is well accounted for in the second rows of both cars. The Suzuki has bottle holders in the doors, as well as a single map pocket. There’s no centre arm-rest, but it has a 12-volt outlet (the Honda doesn’t, but there is one in the centre console up front that could do the trick). The Jazz’s second row also has bottle holders in the doors and betters the Baleno with twin map pockets in the seatbacks, and the taller body gives it better outward vision for those in the rear seat. It feels airier back there, too. The Suzuki is generally very well finished and decently put together, but the quality of the head-lining is below average, and our car even had a couple of poor fitment issues (including a crease! ), and attention to detail is a little lax: for example, the covers of the rear seats were crookedly finished. When it comes to the front row, the two continue the theme of clever storage and above-average space. The Jazz, for example, has a very clever cabin design including a dash-top bottle holder for the driver, and a bit more storage space in front of the gear-shifter than the Baleno. It also has better shaped central cup-holders than the Suzuki (yeah, the Suzuki’s are square! ), and a bigger centre console storage bin. Both have good-sized door pockets for storing bottles and loose items, though the Baleno’s are larger than the Jazz’s, while both have adequate gloveboxes. And while it may not be a deal breaker for some, the sun-visors of the Suzuki are smaller and flimsy, where the Jazz’s are more rigid and they have bigger vanity mirrors. It’s weird that the Baleno has such a high seating position up front – all testers found the height of both the front seats to be a little frustrating (“it’s like driving in a high chair,” said one), and even more so when jumping between the two cars. The Jazz has a much lower seating position, and unlike the Baleno, there’s a pump lever for height adjustment, too. When it comes to media systems, the pair is sorted with 7.0-inch touchscreen units with all the aforementioned connectivity. Of course, we’ve made the point before that Apple CarPlay makes it a car more liveable day-to-day, and that argument is furthered by the infotainment on offer in both of these cars. The Suzuki’s screen is fine, but can be slow to react to inputs, and while the quadrant layout is logical, it isn’t attractive. That said, it’s one of the only screens around that, if you start the car and need to reverse out of a park without wasting time, will display the rear-view camera display before the system and menus load up. And if you’re an Apple user, just plug your phone in and you’ve got a wallpaper. The Honda’s screen is also fine, but not fantastic. The fonts are a bit pixelated and the system can also be hesitant to load, and the controls to jump between menus aren’t as intuitive as the Baleno – despite the fact it looks prettier, and it has an actual wallpaper, if not one that offers you better phone usability. In short, neither car has as good a media interface as the best vehicles in the class: the Mazda 2 with the brand’s MZD Connect rotary dial is our fave despite lacking Apple CarPlay, followed by the touchscreens of the Skoda Fabia and Volkswagen Polo. Both cars have digital information screens, but disappointingly neither has a digital speedometer (the Suzuki’s will display your set speed for its cruise control). The Honda’s monochrome screen is positioned in the instrument cluster as the third dial, where the Baleno’s bright, high-resolution colour screen has not only a better display but also a lot more detail to it, including power and torque meters, and even a G-force meter. Still, that instrument cluster, which has a blue light at night, doesn’t quite gel with the orange backlighting of the buttons. These two little luggers have quite different drivetrains – one is downsized and features forced induction, the other has an extra cylinder and lacks a turbo. The Suzuki has a 1.0-litre three-cylinder turbocharged petrol engine, with 82kW of power (at 5500rpm) and 160Nm of torque (from 1500-4000rpm). It’s front-wheel drive, with a six-speed automatic gearbox with paddleshifters. The Honda’s engine isn’t quite as new school – it isn’t as small, and doesn’t have a turbo. Instead, under its bonnet is a bigger 1.5-litre four-cylinder engine with a bit more power, 88kW at 6600rpm, but a little less torque, 145Nm at a much higher 4600rpm. It’s front-drive, too, and has a continuously variable transmission (CVT) auto with paddles as well. In practice, the differences are marked between the grunt grumblers under the bonnets of these two cars, and it’s no surprise given that the Baleno’s tare mass is just 955 kilograms. The Jazz is a relative porker, tipping the scales at 1120kg (tare weight). The Suzuki’s engine has a good amount of urge under light to mid throttle, but can gasp for breath under really heavy acceleration – indeed, the best response for this engine is in that sweet spot between 1500-4000rpm, and thankfully that’s where you spend most of your time when you’re running around town. Just beware, there can be a little bit of lag from a standstill. Still, the gearbox has an eagerness to go for the highest gear possible, meaning you may find yourself suddenly dropping back a couple of cogs for slight inclines, and that can mean that it feels like you’re running short of pulling power, when in fact you’ve got plenty – just in a lower gear. You can override the transmission by driving in manual mode, but the paddles aren’t the most compliant to driver demands. The Baleno exhibits some thrumming through the steering wheel and the seat at idle. All that said, the drivetrain in the Baleno is more effortless in getting the job done than the Jazz in some situations, as it felt somewhat underpowered in comparison. The Jazz’s engine can get bogged down when you really need it to be hitting its straps. For example, if you slow down to take a tight uphill corner it can be a bit sluggish to react, with the CVT auto robbing it of grunt. Indeed, that CVT makes the Jazz sound (and feel) a little unrefined, and that’s saying something in the company of a grumbly little three-cylinder. If you’re just motoring around the suburbs, though, the engine copes a lot more comfortably under light to mid-throttle, and in those situations the transmission keeps up pretty well and responds decently to sudden throttle inputs. As for fuel consumption, the Baleno’s claimed consumption is lower, as you may expect of a smaller turbo engine, at 5.2 litres per 100 kilometres. On test, we used a bit more than that: 6.9L/100km, and take note that it requires 95-octane premium unleaded fuel. The Jazz’s claimed consumption is a little higher, 5.8L/100km. On test it fared a little worse than that, using 7.8L/100km – and it uses regular unleaded, which could appeal to some purchasers. As well as having very different characteristics to their drivetrains, these two possess differing driving dynamics. The Baleno, for instance, is set up to feel a little softer on the road, whereas the Jazz is firmer, which results in it feeling zippier than its rival. Still, the low kerb weight of the Baleno means it is quicker to get from one corner to the next, and while its wider body gives it a wider footprint on the road – its track is also considerably wider than the Jazz (1520mm v 1476mm front; 1520mm v 1465mm rear) – the Baleno’s tyres let it down. The Bridgestone Ecopia tyres fitted to the Baleno don’t offer quite enough grip to get the best out of the lightweight hatchback’s chassis. I mean, hardly anyone who will buy this sort of car will be thinking of grip at the limit, but the Bridgestone Turanzas on the Jazz do offer a little bit more grip. In fact, the Honda’s better balance and body control meant it felt more at home in corners, and more fun, too. There was some body roll because of its high-topped body, but the steering was considerably more accurate. In fact, the Suzuki’s steering is its biggest downfall. The mismatched weighting and resistance means its really hard to judge what reaction you’ll get from the front of the car in corners, though when you’re pushing it hard, linking one corner to the next, it’s a bit better. But when you’re pottering around on the highway or just around town, the inconsistency of the Suzuki’s steering really gets to a point where it bugs you. It’s a sticky feeling, one that means the steering wheel always feels like it’s trying to return to centre. When you’re trying to park, the Baleno’s steering can be a little bit heavy, and so can the Honda’s, proving a little bit slow to respond and solidly weighted when you start it up. The Honda, though, has a much more trusty feel on centre and better accuracy in all situations. That said, the Jazz is louder than the Baleno, no matter the surface, and its ride is harder, which could be a deal breaker for some. You feel more of the bumps at low speed, but it is better settled after a bump: where the Jazz can jolt a little, the Baleno can bobble and wobble. The Jazz’s balance between composure and comfort appeals to us more than the Baleno, which can be flummoxed by rough sections of road – particularly at high speeds. The Baleno’s body control is a better around town than on the open road, with good bump absorption over speed humps and the like unless the bump is especially sharp, which can make it feel a little clumsy as the front-end can clang on impact. In terms of stopping power, the Jazz again bettered the Baleno, with more consistent braking performance and more linear pedal feel. The Baleno’s brakes were a touch grabbier. It’s not really a dynamic disappointment, but the automated central locking system in the Baleno is annoying: it doesn’t deactivate when you stop and/or put it in park. That means that, say, if you get out after stopping the car and try and grab something from the back seat, the door will be locked. It may have just been an issue with the way our car was set up, and could be reconfigurable – we’d sure hope so. Both cars come with the bare minimum in terms of warranty cover, with each having a three-year/100,000km cover. So if you’re looking to hang on to your car for a longer period, consider alternatives with longer warranties like the Hyundai Accent (five years/unlimited km) or Kia Rio (seven years/unlimited km). Despite their different drivetrains, the Honda and the Suzuki both require servicing every six months or 10,000km (more regular than many competitors that see servicing as an annual/15,000km requirement), and both have capped-price service programs that span five years or 100,000km. The average cost per visit for the Suzuki is $245, while the Honda is a little dearer, at an average of $278. These two are both practical, both feature-focused, and both impressive little hatchbacks for buyers who want their cars to offer more space than their dimensions suggest they should. But despite being newer, having a smarter media screen and packing a more powerful and more modern drivetrain, the Suzuki Baleno isn’t as polished as the Jazz. The Baleno is a nice little car, one that will be better suited to buyers who aren’t planning to hit the open road or push it through corners. The Honda Jazz, though, is a better all-rounder. It is little firmer over bumps, sure – but the upside of that is that it handles better, and that gives you more confidence from the driver’s seat. Add to that it’s super practical packaging and sharper list pricing, and the Honda has to win this test.